The Official Armory for the History Channel's Knight Fight series!!! If you do not see what you are looking for, just ask us. If it is armor, it is likely that we can make it for you! RETURN/EXCHANGE POLICY - We guarantee fit and satisfaction with all of our products. If you are not satisfied with the fit of your new Icefalcon Armor, just return it within 10 days of recieving it an we will adjust your armor to fit or build you another from scratch or give you your money back, less shipping. 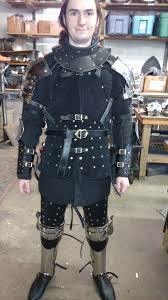 We want your armor to fit you well and we would like you to return to our store knowing that you will get what you pay for. :) For all maille items that are pre-ordered or customized in size or shape, there is a 25% restocking fee on any returns.